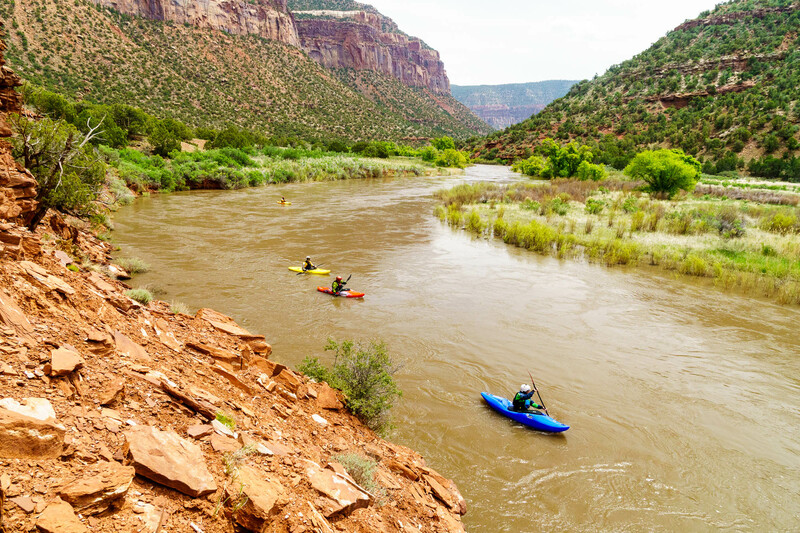 The Lower Dolores River is an incredibly unique desert river trip that starts at 6500′ in a piñon pine forest reminiscent of the Middle Fork and travels through mind-bending Moab-like red rock canyons. The Lower Dolores starts below McPhee Reservoir near the aptly named Dolores, Colorado and travels roughly 170 miles to its confluence with the Colorado River below Westwater Canyon. The most commonly done sections — and the sections we’ll focus on in this article — are Dolores Canyon and Slickrock Canyon, which, together, make up the first 100 miles of river. The river has decent class II-III whitewater (with one bigger rapid), great camping on the upper reach, and scenery that is almost unmatched. This is a five-star river trip for kayakers and rafters alike. It’s worth noting, too, that between the Lower Dolores and the Colorado River (through Moab, and on down through Cataract Canyon), one could turn this into a more than 300 mile desert whitewater float. Daphnee Tuzlak heads through the flats as the Dolores River transitions from piñon pine to slickrock desert. Permits were not required when we did this river in 2017, but they are now. The BLM website will have the latest info, but as of this writing, you’re supposed to call (435) 259-7012 (Moab) or (970) 247-4874 (Tres Rios) between 8 a.m. and noon Monday to Friday to obtain a permit. Firepans and groovers are required on this river (and with good reason; when it does run, it gets hit hard by Colorado river runners). Wally Macfarlane and Justin Jimenez marvel in the beauty of the high desert canyons on the Dolores. There are many options for a multi-day trip on the Dolores. The embedded Google map shows a shuttle for a trip through Dolores and Slickrock Canyons (97 miles). If you really need to cram in a short trip, Slickrock is the most worthwhile section. It’s remote and incredibly scenic. Dolores Canyon has phenomenal camping and is beautiful, but it’s not as unique as Slickrock. We highly recommend the 97 mile Dolores Canyon / Slickrock combo as a relatively short self-support, but continuing on through the Colorado River is a good option as well, especially with healthy flows. There are a number of shuttle services available for the Dolores. We’ve used the Dolores River Shuttle Service reachable at (970)-677-2301 or (970)-739-4561 for Jamie Huskey or (970)-560-1475 for Torie Davis. 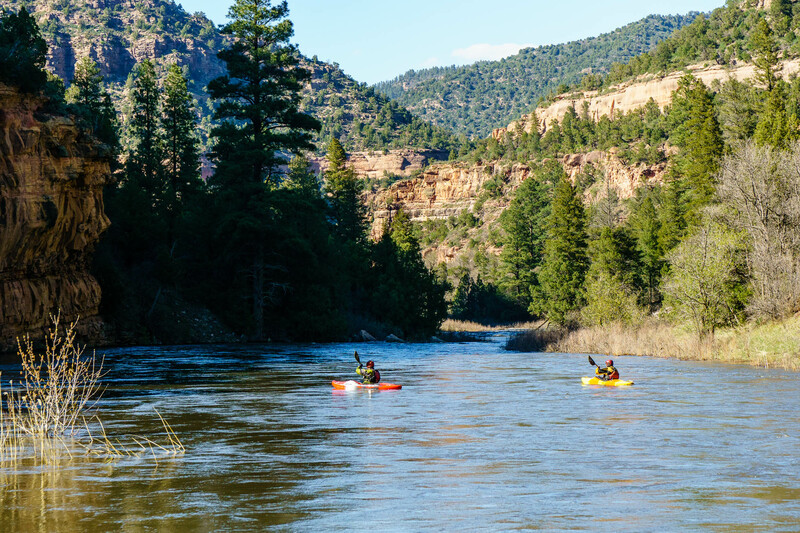 The Dolores River Boating Advocates maintain an up-to-date list of reputable shuttle services on their website. 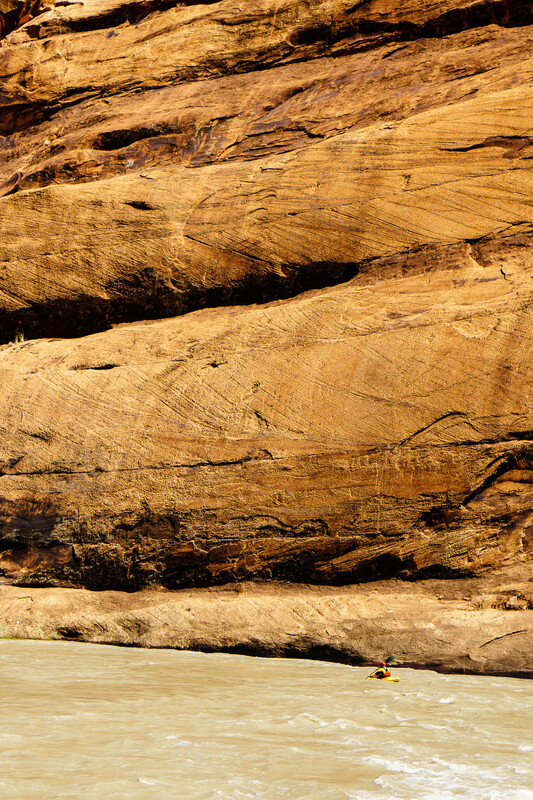 Big, slickrock walls dwarf Justin Jimenez as he paddles the high flow release on the Dolores. Camping in the upper reaches — in Dolores Canyon — is plentiful and really good. The banks are littered with large, flat areas laden with pine needles and shaded by large trees. Once you pass the takeout at Slickrock, things get a bit sparse. The Slickrock canyon is filled with invasive riparian plants that choke the river channel and hide the sandy beaches that might otherwise exist. There are a couple nice camps, but if you’re on the river on a weekend, you’ll want to be conscious of the fact that there are likely more groups than there are camps at any given time, and, as kayakers, it’s courteous to take a smaller camp or even to bushwhack away from the river a bit to a spot that a raft trip couldn’t get to. The lower stretches of the river are mostly closer to a road, but have decent camping available. 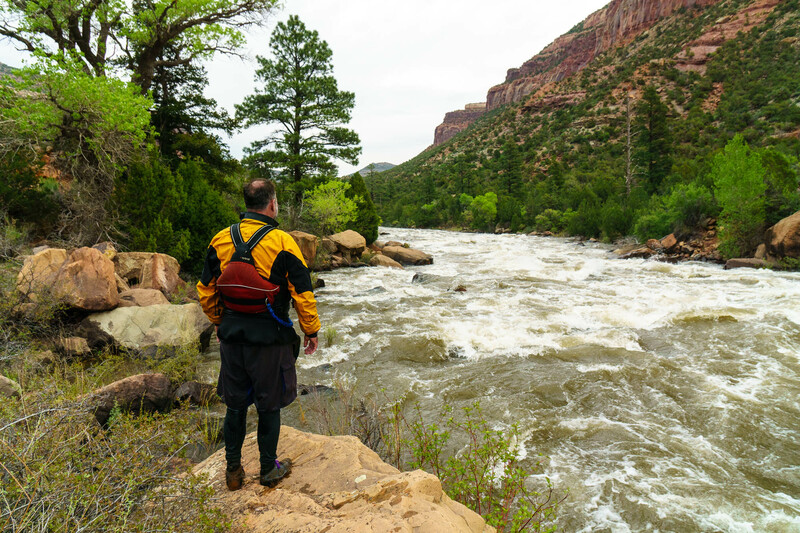 Justin Jimenez scouts Snaggletooth at 4000cfs, a fun, pushy class IV. This one’s the doozy for the Lower Dolores. Unfortunately, McPhee Reservoir impounds most of the water that would flow through the Dolores’s canyons. In big snow years, there can be water for a couple months, but in low snow years, the river may not be runnable at all. American Whitewater just had a major legal victory on the Dolores that protects in-stream flows, but it only guarantees water when there’s enough to meet other obligations, so in low snow years like 2018, it’s unlikely the Dolores will have a boating season at all. More water, more better for kayakers on this river. A reasonable minimum might be 500cfs. An American Whitewater flow study in 2010 called 800cfs the minimum for rafts. Packrafts and canoes could likely go significantly lower. We had 4000cfs in 2017 and it made for fun whitewater and fast travel. Sunset paddling during the 2017 high flow release on the Dolores. 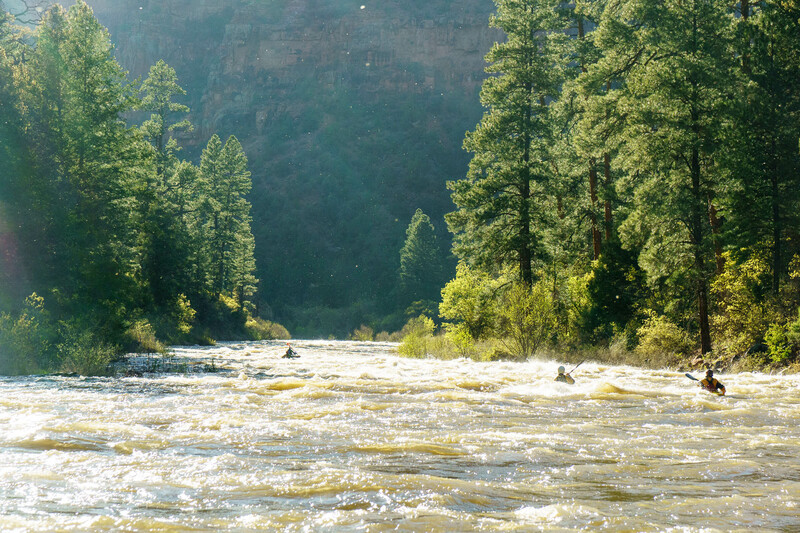 In April, 2018, American Whitewater helped obtain permanent in-stream flow protections for the Dolores River. While it doesn’t mean we’ll have a boating season on the Dolores every year, it’s an improvement, and it’s a huge win for river runners and for the ecology of the Lower Dolores. Please consider becoming an AW member if you aren’t already!